Still focused on the Gospel of St. John, the topics are Feeding the 5,000 and Walking on Water, with discussion of what makes John’s account of both events different. Also included is the first part of a discussion of the unique Themes, Details and Events found only in the Gospel of St. John, beginning with Part 1 of a discussion of the theme of Light vs. Darkness. For the series, I purchased The Rohan Master book of hours from which I am in the processing of extracting illustrations related to St. John, one of which is shown here. The Rohan Master depicts St. John at his desk writing his Gospel with an Eagle (the traditional symbol of St. John) and a banner bearing his name at his feet. Far above, God the Father observes from the upper right. The Rohan Hours volume is considered one of the finest illuminated Hours collections in existence, but I still can’t quite come to grips with the Western practice of depicting God the Father, which was forbidden before the rise of power at Rome in the 12th and 13th centuries. I have also posted a Podcast Homily for Second Sunday in Lent. Scripture topics include St. Matthew’s account of the driving out of a demon from the daughter of a Canaanite woman (described by St. Luke as Syro-Phoenecian), St. Paul’s first epistle to the Thessalonians, Chapter 4, verses 1-8, which is a lecture on controlling passions, both of the mind and body, and I include a back reference to 1 Kings 8 on the issue of whether God hears the prayers of those not of the Israelite tradition or blood. Listen to the Podcast Homily. For this Blog post I have included two illustrations of this event. 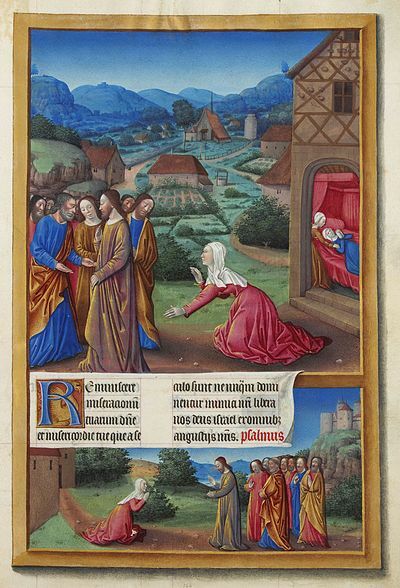 The first is from another Hours collection from Paris around the time of the Rohan book, but this one is by the Limbourg brothers from the Tres Riches Heures of John duc du Berry, which is another tempera and gold leaf creation on vellum. You can see a ripple in the paper at top center. 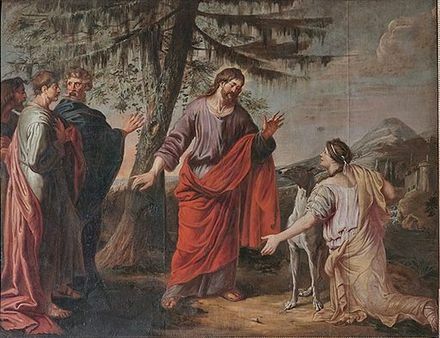 The second illustration is a Baroque style oil on canvas by the Flemish painter, Michael Angelo Immenraet (1621-1683), Some sources claim the painting is from the collection of oil paintings at Union Church, Idstein, Germany, but I have not been able to confirm that. I was not able to find a public domain illustration from the Eastern Church tradition. Somehow, for me, the Immenraet version reminds me of English horse paintings such as those by Stubbs. They lack the spirituality of the Hours manuscripts and the Eastern icons, being focused on anatomical correctness instead. For regular visitors to the blog site, I invite you to compare this one with the Duccio egg tempera and gold leaf on the Raising of Lazarus. Also this week, I finished work on a DVD version of Paintings on Light, my book on the stained glass collection at St. Joseph’s Villa Chapel, Richmond, VA, and a 2-CD version of my Twelve Days of Christmas series. I have not yet set a price for either. Blessings to all of you. And that you for your interest in the Internet ministry of the Anglican Internet Church.